NOTE: Fujifilm Instax Camera and Film are NOT Included. 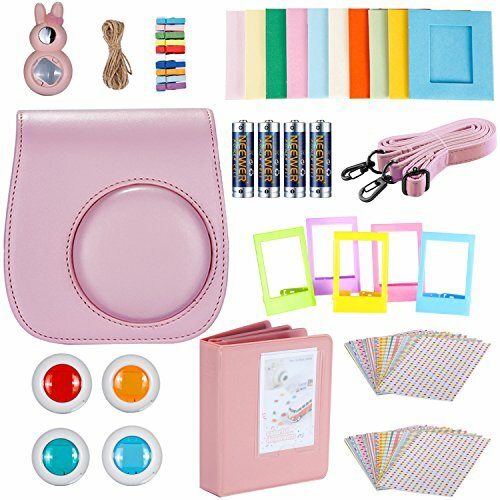 Designed for Fujifilm Instax Mini 8/8s/8+/9 Instant Film Camera. Awesome gift for friends and families. Great for you to DIY your photo with this accessories (Wall Hang Frames/Film Frames/Border Stickers); Use your imagination to create photos with your unique style. This bundle includes a camera case that comes with an adjustable strap to make it easier for you to carry around. It is made of PU leather, making it reliable and durable and the soft microfiber inner provides you with all-round protection you need for your camera. It is an awesome album for your instant mini photos and the right place for your photos to stay. It comes with a mirror that's excellent for taking photos for you and your friends. They are right for close-up pictures and can make your photos outstanding. It can also stand on your desk. It comes with 10 pieces colorful wall decor hanging frames, 10 pieces clips, 1 piece string. It is a cool and cute way to hang your pictures up by using it. It can be used to stick your photos on wall, big album, desk and other places.